MAX7219 and Spotting eBay Fakes #makerbusinessmonday #makerbusiness « Adafruit Industries – Makers, hackers, artists, designers and engineers! I have been receiving feedback that I can use eBay suppliers to lower my price on the MAX7219. I had previously considered that option, but after some research I have found that a lot of people are receiving counterfeits on eBay. While some counterfeits may work, their reliability is questionable and that would make my product unreliable. I do not believe that it is “good business” to support businesses and companies which pirate technology and sell it as if it were legitimate. I sincerely hope everyone understands why I am skeptical about using an unknown supplier for parts. Here is a good forum post about coming across the fake variety: http://www.picaxeforum.co.uk/showthread.php?22481-Real-or-fake The more units I can sell initially will increase my per-part discount, which will allow me to lower my selling price. For example if you look at the picture above, the line across the top is inline with pin 2. f you do a search on eBay or even Google image search you can see that they line up with pin 3. Also mine has a notch and the eBay ones all have a dimple. Not to mention there is no way someone can go to Maxim and get a price much lower then their lowest price they have. 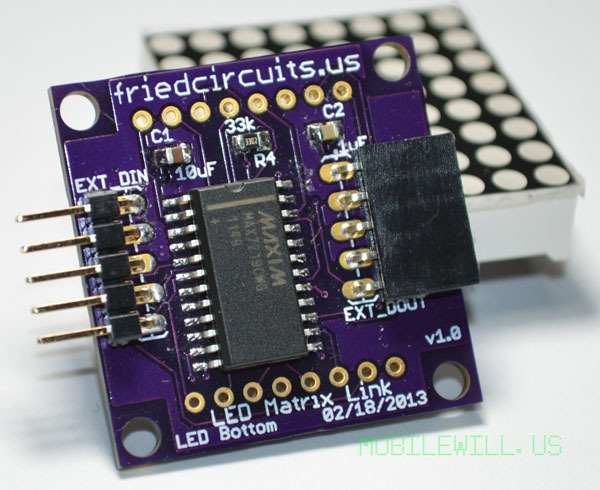 You can buy [my new LED Matrix Link] on my Tindie shop here. Each week on the Adafruit blog we post up about amazing companies, people and articles about being a MAKER and a business. Over the years we’ve shared how we run Adafruit, published code from our shopping cart system and given presentations on running an open-source hardware company. Every Monday we’re going to try to collect some of these resources and tag them #makerbusinessmonday & #makerbusiness. They’re in our popular Maker Business category as well, enjoy!